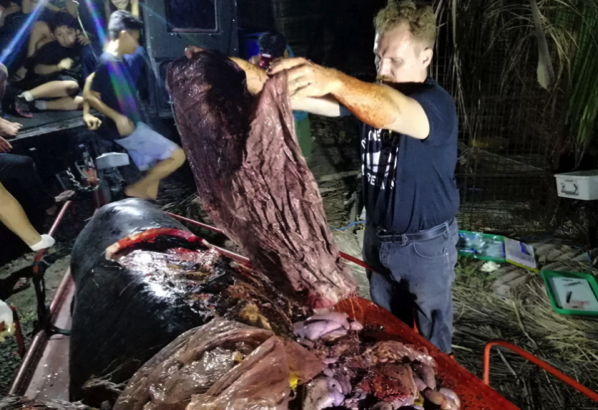 A young Cuvier’s beaked whale washed up dead on a beach in Compostela Valley in the Philippines, its stomach filled with 88 pounds (40 kilograms) of plastic bags. Workers from the D’Bone Collector Museum Inc. in Davao City in the Philippines recovered the whale — a male — on Saturday (March 16) and later performed a necropsy. They found its stomach was packed with plastic bags — 16 rice sacks, four banana-plantation-style bags and some shopping bags. His stomach “had the most plastic we have ever seen in a whale”. Around 8.8 million tons (8 million metric tons) of plastic get dumped into the ocean every year, according to a 2015 report by the nonprofit Ocean Conservancy. In particular, about 60 percent of it comes from China, Indonesia, the Philippines, Thailand and Vietnam.